This is one of my favorite things to eat lately. I love it, my husband loves it, and as long as I take out a portion before adding either olives or Feta cheese, my daughter will eat it too. I’ve also had very positive feedback when taking it to a potluck. It’s not exactly hard to make, but unless you have a sous chef, the veggies will take a while to chop up. So while it’s not something you can whip up in a few minutes, it can be made in advance and will only get more flavorful as time goes on. The instructions are basically to cut everything up and put it all in a bowl. I tend to chop my cucumber and tomato pieces into the same size, and the bell pepper I dice into smaller pieces because it has a stronger flavor. The red onion should be diced as fine as you can get it. When it comes to fresh basil, I say there is no such thing as too much. I stack several leaves together, roll them into a cigar shape, and then cut across the cigar to chop the basil. If you have really large leaves, slice them lengthwise after cutting across. The quantities for the oil and vinegars are an estimate, since veggies vary as do taste buds. Mix everything together, and if it is too bland, add a splash of each vinegar until the salad is tangy. 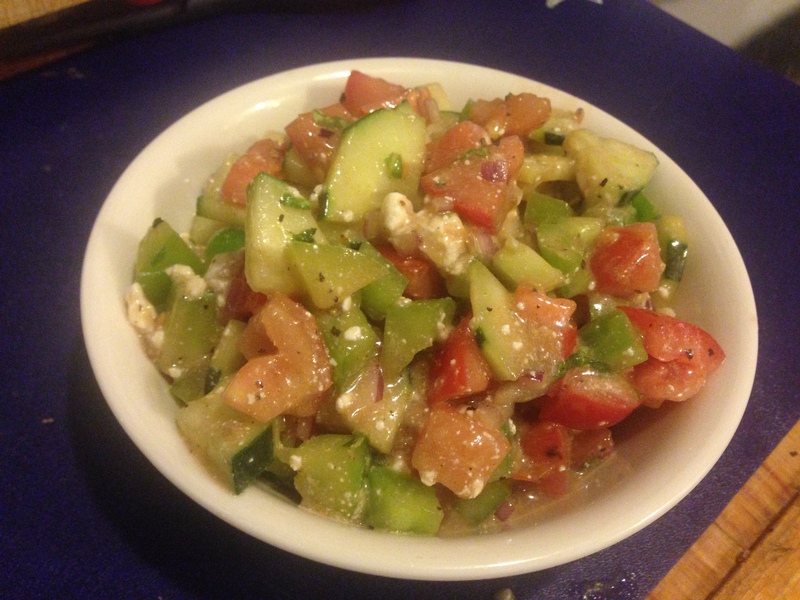 If you add Feta cheese, do so at the very end and avoid over stirring, or else it will break up and be unappetizing.